This issue’s cover is from David McKee’s new picture book, Elmer Plays Hide-and-Seek. David McKee is interviewed by Julia Eccleshare. Thanks to Andersen Press and Random Century for help in producing this March cover. There is something about children's literature which induces in newspaper journalists a form of senile dementia. Adult rationality gives way to abject whimsy. This is most prominently displayed by Barrett (travel editor, no less, of the Mail on Sunday) in his obsessive conviction that everyone in contact with children's books is either casting a spell or is subject to the same. Vesting Regents Park, the 'magic' of The 101 Dalmatians returns to him. Watership Down is 'a magical spot ... with the wind whispering in the trees.' Peter Pan proves to be 'a magical boy who never gets older'. The Secret Garden has 'many magic ingredients'. Life with the Champion of the World's father is (guess what?) 'magical', while 'a treasured part of our growing-up' can be found in 'the tales of magical Beatrix Potter characters such as Peter Rabbit and Pigling Bland' ... and we are still only up to page 66. The glimpse of the author's command of the English language in those quotations perhaps deserves fuller exhibition. How about this: 'Beatrix Potter is arguably the Lake District's most successful writer, perhaps even more popular than the great poet Wordsworth. But her life began in quite different circumstances.' An equivalent sloppiness marks the substance of this travel guide to classic children's books and 'the dreamy "other world" for which good books are the only (?) passport'. To begin with, what of Barrett's view of the limits of his territory? A Christmas Carol and Lorna Doone are, I suppose, children's books by adoption, but Cider with Rosie is surely only one by virtue of exam syllabi, and Rob Roy is probably present only because of the movie (although Barrett claims - on who knows what evidence - that Scott is now 'seen as a writer of books which are mainly read by young people'). His charabanc tour through the 22 titles that make up his final choice is routeless to a degree which shakes confidence in Barrett's role as traveller as well as writer. Once we have got past Wonderland (the rabbit-hole is apparently located just off the Oxford ring road - not far perhaps from 'Christ Church College') we start to take an alphabetic direction: Adams ... Awdry ... Barrie ... Blackmore ..., but once past Dahl we veer off to Potter ... Bawden (Carrie's War) ... Grahame ... and the sequence disintegrates. It ends with St Exupery and The Little Prince, but, disappointingly, there are no recommendations for guest-houses on Asteroid B-162. Our wayward journey is not eased by the commentary of the tour-guide whose formulaic description of each classic site undermines his desire to wow the customers. Plodding through a set sequence of Introduction, Story Precis (often quite dreadful), Author Biography (ditto), and Tour, he is at his best when he gets to Further Information and sets down the useful facts about the presence of related gift shops and museums. All these shortcomings are regrettable, not least because Barrett's initial idea was so full of potential. 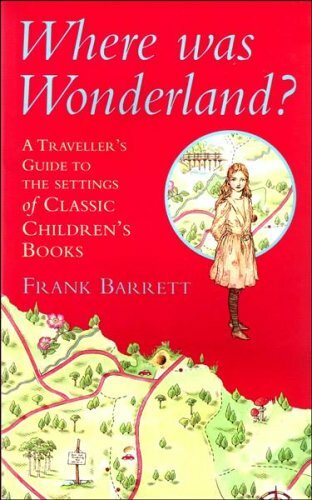 With a careful analysis of the varying ways in which the landscapes of children's literature are created for the reader, and with a rather more engaged and literate exposition, a guide could take the traveller not across sundry carparks but towards a more discriminating awareness of the role of 'setting' as a character within story.